Cheap Sheds is one of the largest Online Storage Solution provider in Australia. We are an Online Retailer and work with our suppliers to provide storage options to the community. 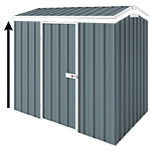 We sell all size products from deck boxes, small sheds and cabinets up to carports, garages and farm steel buildings. We have been in business over 8 years and serve thousands of customers from around the country. So we have made it a priority to provide customers with qualified Installers list to help you get your shed assembled. We do not provide installation within Cheap Sheds but I am happy to provide you with a list of qualified tradesmen or companies in different localities around the country. It is important to understand that we are in no way affiliated or liable for the tradesman workmanship or service. We are only referring them to you. Select one or more installers who service your area and get in touch with them. The installer will provide you a quote and help you with your shed! All brands up to 6x3. 40kms of Mel CBD, additional charge beyond. It is important to understand that we are in no way affiliated or liable for the tradesman workmanship or service. We are only referring them to you. It's best to chat to the individuals and make a decision if you wish to contract them to do the project. We have screened these individuals to ensure they had experience and qualified. Some have Business Social Media Pages where you can connect with them and see their work (which we recommend). If you, or if you know someone who can install sheds and have top-notch handyman skills, why not get in touch and maybe we can add them to the installer list above.